The office of the Bowie County Clerk in New Boston keeps records for births, deaths, and marriages, starting in 1889. The district clerk takes care of divorce records. Many genealogical records are available free from the Bowie County TXGenWeb project. This area of Texas was occupied by Indians as early as the Late Archaic Period, about 1500 BCE. Europeans (Spaniards) probably first arrived on the scene in the late 1600s, but non-native American settlers may not have arrived until the early 1800s. 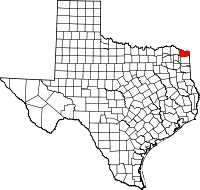 Bowie County was founded in December 1840 and was named for James Bowie.